This plaque is set in the right-hand end wall of the main commemorative area of the cemetery. On the back wall are the 10 plaques listing all 642 dead as well as the special plaques for those from Charly and Alsace. 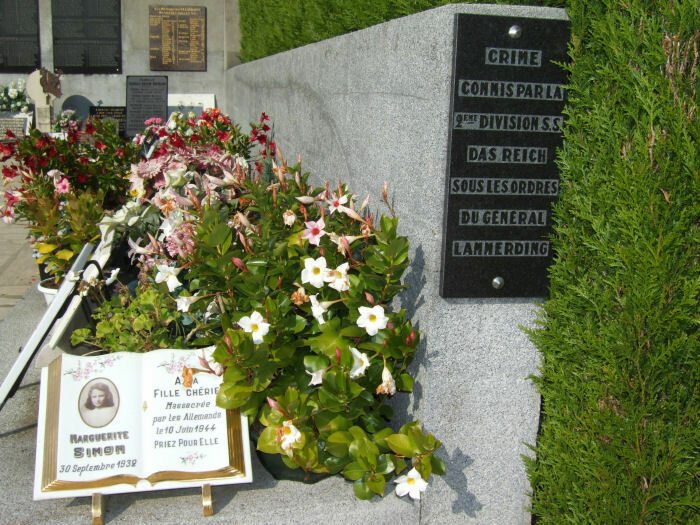 The inscription reads, "Crime committed by the 2nd SS Division Das Reich under orders of General Lammerding" Note the memorial to the 12 year old Marguerite Simon, the memorial plaque for those from Charly and the many flowers. This picture was taken on All Saints Day (Tout-Saints) 1st November 2004.